This article is about the political entities currently (or formerly) called "United States territories". For the historic territories which became U.S. states, see Organized incorporated territories of the United States. For the forms of U.S. jurisdiction, see United States territory. For maps of historical evolution, see Territorial evolution of the United States. San Juan, Puerto Rico, U.S. Territories of the United States are sub-national administrative divisions overseen by the federal government. They differ from U.S. states and Native American tribes, which have limited sovereignty. [note 1] The territories are classified by incorporation and whether they have an "organized" government through an organic act passed by Congress. The U.S. currently has sixteen territories in the Caribbean Sea and the Pacific Ocean. [note 2] Five (American Samoa, Guam, the Northern Mariana Islands, Puerto Rico and the U.S. Virgin Islands) are permanently-inhabited, unincorporated territories; the other nine are small islands, atolls and reefs with no native (or permanent) population. Of the eleven, only one is classified as an incorporated territory. Two territories (Bajo Nuevo Bank and Serranilla Bank) are defacto administered by Colombia. Territories were created to administer newly-acquired land, and most eventually attained statehood. Others, such as the Philippines, Micronesia, the Marshall Islands and Palau, later became independent. Many organized incorporated territories of the United States existed from 1789 to 1959. The first were the Northwest and Southwest territories, and the last were the Alaska and Hawaii Territories. Thirty-one territories (or parts of territories) became states. In the process, some less-developed or -populous areas of a territory were orphaned from it after a statehood referendum. When a portion of the Missouri Territory became the state of Missouri, the remainder of the territory (the present-day states of Iowa, Nebraska, South Dakota and North Dakota, most of Kansas, Wyoming, and Montana, and parts of Colorado and Minnesota) became an unorganized territory. Territorial telecommunications and other infrastructure is generally inferior to that of the U.S. mainland, and American Samoa's Internet speed was found to be slower than several Eastern European countries. Poverty rates are higher in the territories than in the states. This is The United States of America. Wait, no. This is the United States of America. These islands aren’t states, but rather territories of the United States. There are 16 islands here, most of which are in the caribbean, polynesia, or micronesia. 11 of these island territories are less significant than the rest because they have no permanent population. In fact, some of them have an area of less than 5 square miles. The other 5 of the 16 islands are inhabited, and those are the ones you’ve probably heard of. So, what are these 5 islands? First let’s talk about how these territories are organized. Incorporated organized territories are the first of these subclasses. Territories under this group are incorporated, meaning they are not a state, but are still entitled to all parts of the Constitution, besides for parts specifically reserved for states. The organized in the title refers to the Organic Acts, which were acts that gave certain territories the right to self-govern. Organic Acts have been passed for territories in the past, some of which are now states, including my home state of Illinois, Hawaii, Colorado, and even the District of Columbia, to name a few. There are currently no territories in the Incorporated Organized subclass, the last territories in the group being Alaska and Hawaii, both granted statehood in 1959. The second group, Incorporated Unorganized territories, are the same as Incorporated Organized territories except for their lack of a “normal” government. Territories in this group also usually have no or a very small permanent population. The Minnesota, California, and Dakota territories, for example, were all part of this group before becoming states. Currently, the group only includes one territory, Palmyra Atoll. U.S. coastal waters, extending out to about 12 nautical miles, are also Incorporated Unorganized “territories”, along with U.S. flagged vessels, including the Coast Guard, Navy, and U.S. Merchant Marine ships. The U.S. Merchant Marine refers to both federally and civilian owned merchant vessels. The third group, Unincorporated Organized territories, consists of the territories you’ve probably heard of, including Puerto Rico, Guam, the Virgin Islands, and the Northern Mariana Islands. The last group, Unincorporated Unorganized territories, are all desolate islands with no inhabitants, with one exception, the American Samoa. This island is in this group simply because Congress hasn’t done anything about it yet. An uninformed person would expect to see yet another desolate island, just like the others in the group, but instead they’d find over 50,000 people and a lot of tourists. Since these islands are unincorporated, some fundamental rights are given, but other Constitutional rights are not. Of course, the American Samoa is self governing, but it doesn’t fit the description of a not “normally” constituted system of government. So, now that you have a better understanding of the way these territories are grouped, how did they become territories in the first place? The largest territory of all, both population and land wise, is Puerto Rico. This island boasts a large population of 3.7 million making it more populous than 21 states, and has a land area of 3,515 square miles. Puerto Rico was first settled by humans between 3,000 BCE and 2,000 BCE. However, Puerto Rico, in its modern form, was founded on November 19th, 1493 by Columbus himself. He originally named the island San Juan Bautista, but Spanish traders referred to the island as Puerto Rico, meaning rich port, and that name stuck. After enslaving the natives and establishing ports, Columbus sailed onwards to Florida, but the island remained an important trade port. After the United States gained independence from Britain, trade between the nations grew to the point where the US rivaled Spain in trade importance on the island. On September 23rd, 1868, an army of Puerto Ricans claimed independence from Spain for their island in a movement known as Grito de Lares. However, the army was soon defeated by the mightier Spanish army. The island was granted autonomy by Spain in 1897, but a year later the Spanish American war broke out. The United States launched an invasion of Puerto Rico in July of 1898, and claimed the island with little resistance from the inhabitants. In December of the same year, the Treaty of Paris (the 3rd one that involved the US) was signed, officially ending the Spanish American war. It also approved of the cession of Puerto Rico. Because of this, Puerto Rico, the now colony of the US, switched to the US’s monetary system and placed it under tariff protection. Things remained the same until 1947, when the American government gave Puerto Rico the right to elect their own governor. Luis Munoz Marin became the first governor of Puerto Rico that was elected by the people. 3 years later, in 1950, the US government gave the island the right to draft its own Constitution. Another 3 years later, Puerto Rico was changed from a US territory to commonwealth. This means it's a state in every way except name. 4 states, Kentucky, Massachusetts, Virginia, and Pennsylvania are commonwealths in their full, official state names. There is no difference between these 4 commonwealths/states and the 46 other states nowadays. However, when the states were founded they drafted their own Constitutions, written in order to ensure the monarchy doesn’t return. Commonwealth status gives Puerto Ricans common citizenship to the US, common defense, and a common market. But, because the island is not a state, they do not pay federal taxes, and are not able to vote in Congress. They do however send delegates to Congress, but they can’t vote. This makes for an awkward situation when the island has a larger population than 21 states. Guam, with a population of 170,000 and a land area of 210 square miles, is the second largest US territory both population and land wise. The island was purely inhabited by natives until March 6th, 1521 when a Spanish expedition, led by Ferdinand Magellan, arrived with a 3 ship fleet. Magellan was Portuguese, but was sailing for King Charles I of Spain. Magellan's fleet had consisted of 5 ships when they first left from Spain, but 2 ships were lost along the way, and the 3 remaining lost about half their crew. This was because of storms, disease, and mutiny. Magellan's fleet first landed at Umatac, a village on the southwestern coast of the island. Guam wasn’t officially claimed by Spain until 1565, 44 years after Magellan first landed on the island. From 1565 on, the island was a regular port for Spanish traders sailing from Mexico to the Philippines. A few hundred years later, on June 21st, 1898, American troops captured Guam in a bloodless takeover. This was during the Spanish-American war, and Guam was an important Spanish port island. The island wasn’t officially owned by the US until the Treaty of Paris was signed in 1898. From this point on, the island was an important naval station for the US. Because of this, the US made the naval commandant governor of the island. The Navy governed the island as “USS Guam”, and refused any proposals of a civilian government. Besides for serving as a military base, the island was also used for farming. Maize, copra (essentially dried coconut), rice, sugar, and timber were exported, along with fish and refined petroleum. The island continued exporting goods until, on December 8th, 1941, Guam was invaded by the Japanese. The Japanese renamed the island “Omiya Jima”, which means Great Shrine Island. This was one of the countless islands captured by Imperial Japan during World War 2. However, the second Battle of Guam began on July 21st, 1944. It ended when Japanese forces surrendering to US troops on August 10th. Sumay and Hagåtña, Guam’s previous largest towns, were destroyed. With the island back in US hands, they converted it into a naval base like it had been previously, now with airfields. However, Guam’s natives weren’t too happy with this. The result was the Guam Organic Act of 1950, which established Guam as an unincorporated organized territory of the US, the same status held by Puerto Rico. The Immigration Act of 1952, section 307, associated the island with the US even more. It granted everyone born on the island after April 11th, 1899, full US citizenship. 18 years later, on September 11, 1968, Congress passed the Elective Governor Act. This allowed the people of Guam to elect their own governor and lieutenant governor (a lieutenant governor is basically a “vice governor”, if you will). In the current day, the island is still used as an important strategic location for air force and naval bases. In fact, after the US’s leases in the Philippines expired in the 90’s, they relocated many of the troops located there to Guam. The United States Virgin Islands, or USVI, with a population of 106,000 and a land area of 133 square miles, is the third most populous territory island of the United States. The USVI consists of 4 large islands and 50 plus smaller islets and cays. The first European to discover the islands was Christopher Columbus, when he was blown off course during his 1493-1496 voyage. He first landed in modern day Saint Croix island, and continued exploring Saint Thomas and Saint John. By the 1600s, many European countries were interested in establishing colonies on the islands, including England, France, Spain, Denmark, and the Netherlands. England and the Netherlands followed through with their plans in the 1620s, when they jointly settled Saint Croix island. Puerto Rico, still under Spanish control, invaded the small colony, causing the French to intervene. They were able to fend off the invasion, and took the colony for themselves. It remained under French control until 1733. The Danish West India and Guinea Company founded the second settlement on the islands in 1665, which was on modern day Saint Thomas island. Their new settlement had a mere 113 residents. Wanting to expand, they founded their second settlement, which was in modern day Saint John island in 1692. The Danish had claimed the island since the 1680s, but they hadn’t been able to settle due to their feud with the neighboring British city Tortola. In order to maintain their relationship with the Danish, they eventually ceased their opposition. The Danes joined the West India Company and settled Saint John. After they settled, the agricultural business exploded on the island. The Danish West Indian Company purchased St. Croix from the French in 1733, uniting St. Thomas, St. Croix, and St. John together as the Danish West Indies. The island remained under Danish control until 1917, until the US bought the islands for strategic reasons in the ongoing World War 1. The islands of St. Croix, St. Thomas, and St. John became the United States Virgin Islands. The Northern Mariana Islands, officially known as the Commonwealth of the Northern Mariana Islands, with a population of 77,000 and a land area of 179 square miles, is the 4th most populous territory of the United States. The commonwealth consists of 22 islands, all of which are part of the larger chain of islands simply known as the Mariana Islands. The Mariana Islands chain even includes Guam, though it is politically separated. Saipan is the largest of the islands with a land area of 46.5 square miles, and is where the capital, Chalan Kanoa, is located. The islands were only inhabited by the Chamorro people until European explorers settled the islands in 1668. The Chamorro people are believed to have come from Southeast Asia to the islands around 2,000 BCE. They were skilled sailors and craftsmen, making intricate weavings and pottery. Chamorro farmers mainly grew sweet potatoes and yams, planting the seeds based on the phases of the moon and ocean tides. The islands were under Spanish rule from their first meeting with Ferdinand Magellan until 1899, when they were sold to Germany. Germany then relinquished the islands to Japan as the empire went against Germany. The islands did not become US owned until the Trust Territory of the Pacific Islands was put into effect in 1947, following World War 2. Initially the islands included in the trust were under the control of the US Navy, but in 1951, they were transferred to the Department of the Interior. This would remain this way until the trust was dissolved by the UN in 1990. This made the Commonwealth of the Northern Mariana Islands an American territory. The American Samoa, officially known as the Territory of American Samoa, with a population of 56,000 and a land area of 76 square miles, is the least populated of the populated island territories. The island has been inhabited by Samoan people since around 1,500 BCE. In 1722, Dutch explorer Jacob Roggeveen was the first European to encounter the islands. Even after Europeans knew of the island, their influence was limited to occasionally trading with the islanders. In the 1830s, missionaries from the London Missionary Society arrived on the Samoa Islands. The missionaries converted the islanders to Christianity with great success. Some of these missionaries, along with traders, enjoyed the islands so much that they settled there. They established their own communities, with governments and laws. The natives and the settlers lived in peace for many years. 42 years later, in 1872, the United States asked the high chief of tribes on the eastern Samoa islands for permission to establish a naval base in exchange for military protection. The base was greenlighted, and was built 6 years later in 1878. By the end of the century, both Britain and Germany were competing for control of the island. As a result of the second Samoan Civil War, a treaty between Great Britain, Germany, and the US was drafted, making island became an official territory of the United States. Uniquely, citizens of this island territory are not granted citizenship to the United States because of the territory’s odd classification under Unincorporated unorganized. Instead of citizens, the islanders are American nationals. This means that they can live and work in the states and other territories but cannot vote in elections unless they go through normal immigration processes. So that’s the US, 50 states and 13 islands (5 of which aren’t desolate), with, like everything else, a deeper history than you would have thought. The U.S. has had territories since its beginning. According to federal law, the term "United States" (used in a geographical sense) means "the continental United States, Hawaii, Puerto Rico, Guam, and the United States Virgin Islands". Since 1986, the Northern Mariana Islands have also been considered part of the U.S. A 2007 executive order included American Samoa in the U.S. "geographical extent", as reflected in the Federal Register. All territories are in the Northern Hemisphere, except for American Samoa and Jarvis Island. Each territory[note 4] is self-governing with three branches of government, including a locally-elected governor and a territorial legislature. It elects a non-voting member (a non-voting resident commissioner in the case of Puerto Rico) to the U.S. House of Representatives. They "possess the same powers as other members of the House, except that they may not vote [on the floor] when the House is meeting as the House of Representatives"; they debate, are assigned offices and staff funding, and nominate constituents from their territories to the Army, Navy and Marine Corps, Air Force and Merchant Marine academies. They can vote in their appointed House committees on all legislation presented to the House, they are included in their party count for each committee, and they are equal to senators on conference committees. Depending on the Congress, they may also vote on the floor in the House Committee of the Whole. In January 2017, the members of Congress from the territories were Gregorio Sablan (Northern Mariana Islands), Madeleine Bordallo (Guam), Amata Coleman Radewagen (American Samoa), Jenniffer González (Puerto Rico) and Stacey Plaskett (U.S. Virgin Islands). The District of Columbia also has a non-voting delegate. Like the District of Columbia, U.S. territories do not have voting representation in Congress and have no representation in the Senate. Every four years, U.S. political parties nominate presidential candidates at conventions which include delegates from the territories. U.S. citizens living in the territories cannot vote in the general presidential election, and non-citizen nationals in American Samoa cannot vote for president. The territorial capitals are Pago Pago (American Samoa), Hagåtña (Guam), Saipan (Northern Mariana Islands), San Juan (Puerto Rico) and Charlotte Amalie (U.S. Virgin Islands). Their governors are Lolo Matalasi Moliga (American Samoa), Eddie Baza Calvo (Guam), Ralph Torres (Northern Mariana Islands), Ricardo Rosselló (Puerto Rico) and Kenneth Mapp (U.S. Virgin Islands). American Samoa – Territory since 1900; after the end of the Second Samoan Civil War, the Samoan Islands were divided into two regions. The U.S. controlled the eastern half of the islands. In 1900, the Treaty of Cession of Tutuila took effect. The Manuʻa islands became part of American Samoa in 1904, and Swains Island became part of American Samoa in 1925. Congress ratified American Samoa's treaties in 1929. American Samoa is locally self-governing under a constitution last revised in 1967. [note 7] People born in American Samoa are U.S. nationals. American Samoa is technically unorganized, and its main island is Tutuila. Guam – Territory since 1899, acquired at the end of the Spanish–American War. Guam is the home of Naval Base Guam and Andersen Air Force Base. It was organized under the Guam Organic Act of 1950, which granted U.S. citizenship to Guamanians and gave Guam a local government. In 1968, the act was amended to permit the election of a governor. Northern Mariana Islands – A commonwealth since 1986, the Northern Mariana Islands were part of the Spanish Empire until 1899 and part of the German Empire from 1899 to 1919. They were administered by Japan as a League of Nations mandate until the islands were conquered by the United States during World War II. They became part of the United Nations Trust Territory of the Pacific Islands (TTPI) in 1947, administered by the United States as U.N. trustee. The other constituents of the TTPI were Palau, the Federated States of Micronesia and the Marshall Islands. A covenant to establish the Northern Mariana Islands as a commonwealth in political union with the United States was negotiated by representatives of both political bodies; it was approved by Northern Mariana Islands voters in 1975, and came into force on March 24, 1976. In accordance with the covenant, the Northern Mariana Islands constitution partially took effect on January 9, 1978 and became fully effective in November 1986. The covenant is one of the two principal documents of the multi-document CNMI constitution; the second is the local constitution, which was approved in a 1977 referendum. [citation needed] In 1986, the Northern Mariana Islands formally left U.N. trusteeship. The abbreviations "CNMI" and "NMI" are both used in the commonwealth. Most of its residents live on Saipan, the main island. Puerto Rico – Unincorporated territory since 1899; Puerto Rico was acquired at the end of the Spanish–American War, and has been a U.S. commonwealth since 1952. The island was organized under the Puerto Rico Federal Relations Act of 1950 (Public Law 600). In November 2008, a U.S. District Court judge ruled that a series of Congressional actions have had the cumulative effect of changing Puerto Rico's status from unincorporated to incorporated. The issue is proceeding through the courts, however, and the U.S. government still refers to Puerto Rico as unincorporated. A Puerto Rican attorney has called the island "semi-sovereign". Puerto Rico has a statehood movement, whose goal is to make the island the 51st state. See also Political status of Puerto Rico. U.S. Virgin Islands – Purchased by the U.S. from Denmark in 1917 and organized under the Revised Organic Act of the Virgin Islands in 1954, U.S. citizenship was granted in 1927. The main islands are Saint Thomas, Saint John and Saint Croix. Except for Guam, the inhabited territories lost population from 2010 to 2017. Although the territories have higher poverty rates than the mainland U.S., they have high Human Development Indexes. Four of the five territories have another official language, in addition to English. The territories do not have administrative counties. [note 10] The U.S. Census Bureau counts Puerto Rico's 78 municipalities, the U.S. Virgin Islands' three main islands, all of Guam, the Northern Mariana Islands' four municipalities, and American Samoa's three districts and two atolls as county equivalents. The Census Bureau also counts each of the U.S. Minor Outlying Islands as county equivalents. 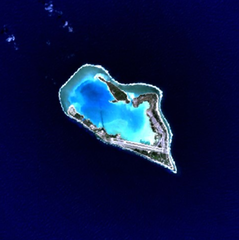 The United States Minor Outlying Islands are small islands, atolls and reefs. Palmyra Atoll, Baker Island, Howland Island, Jarvis Island, Johnston Atoll, Kingman Reef, Midway Atoll and Wake Island are in the Pacific Ocean, and Navassa Island, Serranilla Bank, and Bajo Nuevo Bank are in the Caribbean Sea. Palmyra Atoll (formally known as the United States Territory of Palmyra Island) is the only incorporated territory, a status it has maintained since Hawaii became a state in 1959. The status of several territories is disputed. Navassa Island is disputed by Haiti, Wake Island is disputed by the Marshall Islands, Swains Island (part of American Samoa) is disputed by Tokelau, and Serranilla Bank and Bajo Nuevo Bank (both administered by Colombia) are disputed by Colombia, Jamaica, Honduras, and Nicaragua.. They are uninhabited except for Midway Atoll, whose approximately 40 inhabitants are employees of the Fish and Wildlife Service and their services provider; Palmyra Atoll, whose population varies from four to 20 Nature Conservancy and Fish and Wildlife staff and researchers; and Wake Island, which has a population of about 100 military personnel and civilian employees. Bajo Nuevo Bank North Atlantic Ocean & Caribbean Sea 110 km2 (42 sq mi) Unincorporated & unorganized Administered by Colombia. Claimed by the U.S. (under the Guano Islands Act) and Jamaica. A claim by Nicaragua was resolved in 2012 in favor of Colombia by the International Court of Justice, although the U.S. was not a party to that case and does not recognize the jurisdiction of the ICJ. Baker Island[a] North Pacific Ocean 2.1 km2 (0.81 sq mi) Unincorporated, unorganized Claimed under the Guano Islands Act on October 28, 1856. Annexed on May 13, 1936, and placed under the jurisdiction of the United States Department of the Interior. Jarvis Island[a] South Pacific Ocean (Polynesia) 4.75 km2 (1.83 sq mi) Unincorporated, unorganized Claimed under the Guano Islands Act on October 28, 1856. Annexed on May 13, 1936, and placed under the jurisdiction of the Interior Department. Kingman Reef[a] North Pacific Ocean 18 km2 (6.9 sq mi) Unincorporated, unorganized Claimed under the Guano Islands Act on February 8, 1860. Annexed on May 10, 1922, and placed under the jurisdiction of the Navy Department on December 29, 1934. Palmyra Atoll North Pacific Ocean 12 km2 (5 sq mi) Incorporated, unorganized Partially privately owned by the Nature Conservancy, with much of the rest owned by the federal government and managed by the Fish and Wildlife Service. It is an archipelago of about 50 small islands with a land area of about 1.56 sq mi (4.0 km2), about 1,000 miles (1,600 km) south of Oahu. The atoll was acquired through the annexation of the Republic of Hawaii in 1898. When the Territory of Hawaii was incorporated on April 30, 1900, Palmyra Atoll was incorporated as part of that territory. When Hawaii became a state in 1959, however, an act of Congress excluded the atoll from the state. Palmyra remained an incorporated territory, but received no new, organized government. Serranilla Bank North Atlantic Ocean & Caribbean Sea 350 km2 (140 sq mi) Unincorporated & unorganized Administered by Colombia; site of a naval garrison. Claimed by the U.S (since 1879 under the Guano Islands Act), Honduras, and Jamaica. A claim by Nicaragua was resolved in 2012 in favor of Colombia by the International Court of Justice, although the U.S. was not a party to that case and does not recognize the jurisdiction of the ICJ. Wake Island[a] Western Pacific Ocean (Micronesia) 7.4 km2 (2.9 sq mi) Unincorporated, unorganized Territory since 1898; host to the Wake Island Airfield, administered by the U.S. Air Force. Also claimed by the Marshall Islands. ^ a b c d e f These six territories and Palmyra Atoll make up the Pacific Remote Islands Marine National Monument. Congress decides whether a territory is incorporated or unincorporated. The U.S. constitution applies to each incorporated territory (including its local government and inhabitants) as it applies to the local governments and residents of a state. Incorporated territories are considered part of the U.S., rather than possessions. The U.S. Supreme Court, in its 1901–1905 Insular Cases, ruled that the constitution extended to U.S. territories. The court also established the doctrine of territorial incorporation, in which the constitution applies fully to incorporated territories (such as the territories of Alaska and Hawaii) and partially in the unincorporated territories of Puerto Rico, Guam and the Philippines. In Glidden Company v. Zdanok, the court cited Balzac and said about courts in unincorporated territories: "Upon like considerations, Article III has been viewed as inapplicable to courts created in unincorporated territories outside the mainland ... and to the consular courts established by concessions from foreign countries ...":547 The judiciary determined that incorporation involves express declaration or an implication strong enough to exclude any other view, raising questions about Puerto Rico's status. In Rassmussen v. U.S., the Supreme Court quoted from Article III of the 1867 treaty for the purchase of Alaska and then said: "'The inhabitants of the ceded territory ... shall be admitted to the enjoyment of all the rights, advantages, and immunities of citizens of the United States ...' This declaration, although somewhat changed in phraseology, is the equivalent ... of the formula, employed from the beginning to express the purpose to incorporate acquired territory into the United States, especially in the absence of other provisions showing an intention to the contrary. ":522 The act of incorporation affects the people of the territory more than the territory per se by extending the Privileges and Immunities Clause of the Constitution to them, such as its extension to Puerto Rico in 1947; however, Puerto Rico remains unincorporated. The 2016 Supreme Court case Puerto Rico v. Sanchez Valle ruled that territories do not have sovereignty. That year, the court declined to rule on a lower-court ruling in Tuana v. United States that American Samoans are not citizens at birth. Organized territories are lands under federal sovereignty (but not part of any state) which were given a measure of self-rule by Congress through an organic act subject to the Congress's plenary powers under the territorial clause of the Constitution's Article Four, section 3. Corn Islands (1914–1971): leased for 99 years under the Bryan-Chamorro Treaty, but returned to Nicaragua when the treaty was annulled in 1970. Line Islands: disputed claim with the United Kingdom. U.S. claim to most of the islands was ceded to Kiribati upon its independence in 1979, but the U.S. retained Kingman Reef, Palmyra Atoll and Jarvis Island. Panama Canal Zone (1903–1979): sovereignty returned to Panama under the Torrijos-Carter Treaties of 1978. The U.S. retained a military base and control of the canal until December 31, 1999. Philippine Islands (1898–1935) and the Commonwealth of the Philippines (1935–46): granted independence on July 4, 1946. Phoenix Islands: disputed claim with the United Kingdom. U.S. claim ceded to Kiribati upon its independence in 1979. Baker and Howland Islands, sometimes considered part of this group, are retained by the U.S.
Quita Sueño Bank (1869–1981): claimed under the Guano Islands Act; claim abandoned in a September 7, 1981 treaty. Roncador Bank (1856–1981): claimed under the Guano Islands Act; ceded to Colombia in September 7, 1981 treaty. Swan Islands (1863–1972): claimed under the Guano Islands Act; ceded to Honduras in a 1972 treaty. Veracruz: occupied from April 21 to November 23, 1914, after the Tampico Affair during the Mexican Revolution. Dominican Republic: occupied from 1916 to 1924 and from 1965 to 1966. Trust Territory of the Pacific Islands (1947–1986): liberated in World War II; included the Compact of Free Association nations (the Marshall Islands, the Federated States of Micronesia, Palau) and the Northern Mariana Islands. Ryukyu Islands, including Okinawa (U.S. occupation 1952–1972): returned to Japan in an agreement including the Daitō Islands. Nanpō Islands and Marcus Island (1945–1968): Occupied after World War II, and returned to Japan by mutual agreement. Occupation of Iceland in World War II (1941–1946); military base retained until 2006. Clipperton Island (1944–1945): occupied territory, returned to France on October 23, 1945. United States Army Military Government in Korea: Occupation south of the 38th parallel from 1945 to 1948. Free Territory of Trieste (1947–1954): The U.S. co-administered a portion of the territory (between the Kingdom of Italy and the former Kingdom of Yugoslavia) with the United Kingdom. Representative Stephanie Murphy of Florida said about a 2018 bill to make Puerto Rico the 51st state, "The hard truth is that Puerto Rico’s lack of political power allows Washington to treat Puerto Rico like an afterthought, as the federal government’s inadequate preparation for and response to Hurricane Maria made crystal clear." According to Governor of Puerto Rico Ricardo Rosselló, "Because we don’t have political power, because we don’t have representatives, [no] senators, no vote for president, we are treated as an afterthought." Rosselló called Puerto Rico the "oldest, most populous colony in the world". ^ Some residents of Sikaiana (also known as the Stewart Islands) believe that Sikaiana is part of the United States: "They base their claim on the assertion that the Stewart Islands were ceded to King Kamehameha IV and accepted by him as part of the Kingdom of Hawaii in 1856 and, thus, were part of the Republic of Hawaii (which was declared in 1893) when it was annexed to the United States by law in 1898." However, Sikaiana was not included within "Hawaii and its dependencies". ^ In Tuana v. United States, it was ruled that citizenship-at-birth is not a right in unincorporated regions of the U.S. — current citizenship-at-birth in Guam, the Northern Mariana Islands, Puerto Rico and the U.S. Virgin Islands is granted only because the U.S. Congress passed legislation granting citizenship to those territories. The Supreme Court declined to rule on the case. ^ American Samoa, technically unorganized, is de facto organized. ^ U.S. sovereignty took effect on November 3, 1986 (Eastern Time) and on November 4, 1986 (local Northern Mariana Islands Chamorro Time). ^ The revised constitution of American Samoa was approved on June 2, 1967 by Stewart L. Udall, then U.S. Secretary of the Interior, under authority granted on June 29, 1951. It became effective on July 1, 1967. ^ "Definition of Terms - 1120 Acquisition of U.S. Nationality in U.S. Territories and Possessions" (PDF). U.S. Department of State Foreign Affairs Manual Volume 7- Consular Affairs. U.S. Department of State. ^ a b Wolf, Richard (June 9, 2016). "Puerto Rico not sovereign, Supreme Court says". USA Today. Retrieved January 19, 2018. ^ "Definitions of Insular Area Political Organizations". U.S. Department of the Interior. June 12, 2015. ^ U.S. Insular Areas. Application of the U.S. Constitution (PDF) (Report). United States General Accounting Office. November 1997. p. 39. Retrieved September 19, 2018. ^ Van Dyke, Jon M.; Richardson, William S. (March 23, 2007). "Unresolved Maritime Boundary Problems in the Caribbean" (PDF). Harte Research Institute for Gulf of Mexico Studies. Retrieved January 30, 2018. ^ "Bajo Nuevo Bank (Petrel Islands) and Serranilla Bank". Wondermondo.com. Retrieved January 30, 2018. ^ United States Summary, 2010: Population and housing unit counts. U.S. Department of Commerce, Economics and Statistics Administration, U.S. Census Bureau. 2012. ^ Smith, Gary Alden (February 28, 2011). State and National Boundaries of the United States. McFarland. p. 170. ISBN 9781476604343. ^ Gold, Susan Dudley (September 2010). Missouri Compromise. Marshall Cavendish. p. 33. ISBN 9781608700417. ^ Murph, Darren. "The most expensive internet in America: fighting to bring affordable broadband to American Samoa". Engadget. Retrieved November 24, 2017. ^ a b Sagapolutele, Fili (March 2, 2017). "American Samoa Governor Says Small Economies 'Cannot Afford Any Reduction In Medicaid' | Pacific Islands Report". www.pireport.org. Retrieved January 9, 2018. ^ "Poverty Determination in U.S. Insular Areas" (PDF). Retrieved January 9, 2018. ^ Bartholomew H. Sparrow (2005). Sanford Levinson; Bartholomew H. Sparrow, eds. The Louisiana Purchase and American Expansion, 1803–1898. Rowman & Littlefield. p. 232. ISBN 978-0-7425-4984-5. Retrieved December 2, 2012. ^ a b "8 FAM 301.1 (U) ACQUISITION BY BIRTH IN THE UNITED STATES". State Department Foreign Affairs Manual (FAM). Retrieved July 18, 2018. ^ "Executive Order 13423—Strengthening Federal Environmental, Energy, and Transportation Management" (PDF). United States Department of State. § 9(l). ^ a b c d "American Samoa and the Citizenship Clause: A Study in Insular Cases Revisionism". Harvard Law Review. Retrieved January 5, 2018. ^ Nativity by Place of Birth and Citizenship Status, United States Census, 2010. ^ a b 8 FAM 301.1-1(b). State Department Foreign Affairs Manual (FAM) Vol 8. However, as reported in Samoa lawsuit, Newsweek, July 13, 2012. viewed December 16, 2012. ^ Joshua Keating. (June 15, 2015). "How Come American Samoans Still Don't Have U.S. Citizenship at Birth?". Slate. Retrieved January 1, 2018. ^ "U.S. Insular Areas: Application of the U.S. Constitution" (PDF). U.S. General Accounting Office. November 1997. pp. 8, 14, 27. Retrieved September 3, 2015. ^ "Common Core Document of the United States of America". www.state.gov. December 30, 2011. Retrieved September 3, 2015. ^ "The United Nations and Decolonization". www.un.org. Retrieved September 3, 2015. ^ a b "The House Explained | House.gov". www.house.gov. Retrieved January 26, 2013. ^ "Application of the U.S. Constitution" (PDF). U.S. Government Accountability Office. November 1997. pp. 26–28. ^ "PLASKETT, Stacey E. | US House of Representatives: History, Art & Archives". history.house.gov. Retrieved August 10, 2015. ^ a b Locker, Melissa (March 9, 2015). "Watch John Oliver Cast His Ballot for Voting Rights for U.S. Territories". Time. Retrieved January 1, 2018. ^ a b Cohn, Alicia (September 19, 2018). "Puerto Rico governor asks Trump to consider statehood". TheHill. Retrieved September 22, 2018. ^ "2016 Presidential Primaries, Caucuses, and Conventions Alphabetically by State". Green Papers. Retrieved September 3, 2015. ^ "Dependencies and Areas of Special Sovereignty". U.S. Department of State. ^ a b c d "8 FAM 302.6 ACQUISITION BY BIRTH IN THE COMMONWEALTH OF THE NORTHERN MARIANA ISLANDS". fam.state.gov. Retrieved October 31, 2018. ^ a b c "Proclamation 5564—United States Relations With the Northern Mariana Islands, Micronesia, and the Marshall Island". The American Presidency Project. Retrieved October 31, 2018. ^ a b Firestone, Michelle (September 25, 2017). "Puerto Rico's Status Explained. ECSU Takes A Look At Island's History" (PDF). Retrieved November 13, 2018. ^ "History of Samoa - Samoa.travel". www.samoa.travel. Retrieved November 12, 2018. ^ a b c d e "American Samoa | Culture, History, & People". Encyclopedia Britannica. Retrieved November 12, 2018. ^ a b c "American Samoa". Pacific Islands Benthic Habitat Mapping Center. Retrieved September 22, 2018. ^ a b c "Guam | History, Geography, & Points of Interest". Encyclopedia Britannica. Retrieved November 12, 2018. ^ a b c d "Northern Mariana Islands | history - geography". Encyclopedia Britannica. Retrieved October 31, 2018. ^ "Trust Territory of the Pacific Islands | former United States territory, Pacific Ocean". Encyclopedia Britannica. Retrieved October 31, 2018. ^ a b "Australia - Oceania :: Northern Mariana Islands — The World Factbook - Central Intelligence Agency". CIA World Factbook. Retrieved October 31, 2018. ^ "Milestones: 1866–1898 - Office of the Historian". history.state.gov. Retrieved November 12, 2018. ^ "Consejo de Salud Playa Ponce v. Johnny Rullan" (PDF). ^ Gelpí, Hon. Gustavo A. "The Insular Cases: A Comparative Historical Study of Puerto Rico, Hawai'i, and the Philippines" (PDF). The Federal Lawyer (March/April 2011): 25. Retrieved February 18, 2019. ^ Stern, Mark Joseph (January 14, 2016). "The Supreme Court Ponders Whether Puerto Rico Is a Fake State or a Real Colony". Slate Magazine. Retrieved January 19, 2018. ^ Mosbergen, Dominique (June 28, 2018). "Bipartisan Bill Seeks To Make Puerto Rico The 51st U.S. State By 2021". Huffington Post. Retrieved September 22, 2018. ^ "8 U.S. Code § 1406 - Persons living in and born in the Virgin Islands". LII / Legal Information Institute. Retrieved September 21, 2018. ^ a b "Language situation in the U.S. | About World Languages". aboutworldlanguages.com. Retrieved 17 January 2018. ^ a b "Virgin Islands Language". Virgin Islands. Retrieved 17 January 2018. ^ "State Population Totals: 2010-2017". Census.gov. Retrieved 9 January 2018. ^ "POVERTY STATUS IN 2009 BY AGE Universe: Population for whom poverty status is determined more information 2010 U.S. Virgin Islands Summary File". U. S. Census Bureau. Retrieved 9 January 2018. "POVERTY STATUS IN 2009 BY AGE Universe: Population for whom poverty status is determined more information 2010 Guam Summary File". U. S. Census Bureau. Retrieved 9 January 2018. "POVERTY STATUS IN 2009 BY AGE Universe: Population for whom poverty status is determined more information 2010 Commonwealth of the Northern Mariana Islands Summary File". U. S. Census Bureau. Retrieved 9 January 2018. "POVERTY STATUS IN 2009 BY AGE Universe: Population for whom poverty status is determined more information 2010 American Samoa Summary File". U. S. Census Bureau. Retrieved 9 January 2018. ^ "U.S. Census Bureau QuickFacts: Puerto Rico". U. S. Census Bureau. Retrieved 9 January 2018. ^ A. Hastings, David. "Filling Gaps In The Human Development Index: Findings For Asia And The Pacific" (PDF). United Nations Economic and Social Commission for Asia and the Pacific (ESCAP). Retrieved 9 January 2018. ^ R. Fuentes-Ramírez, Ricardo (14 May 2017). "Human Development Index Trends and Inequality in Puerto Rico 2010-2015". Ceteris Paribus. Retrieved 9 January 2018. ^ "American Samoa | Data". data.worldbank.org. Retrieved 9 January 2018. "Virgin Islands (U.S.) | Data". data.worldbank.org. Retrieved 9 January 2018. "Northern Mariana Islands | Data". data.worldbank.org. Retrieved 9 January 2018. "Guam | Data". data.worldbank.org. Retrieved 9 January 2018. "Puerto Rico | Data". data.worldbank.org. Retrieved 9 January 2018. ^ "GAO - American Samoa and the Commonwealth of the Northern Mariana Islands - Economic Indicators Since Minimum Wage Increases Began" (PDF). U.S. Government Accountability Office. March 2014. p. 39. Retrieved October 7, 2018. 2010 FIPS Codes for Counties and County Equivalent Entities. Census.gov. Retrieved September 22, 2018. States, Counties, and Statistically Equivalent Entities (Chapter 4). Census.gov. Retrieved September 22, 2018. ^ U.S. General Accounting Office Report, U.S. Insular Areas: application of the U.S. Constitution, November 1997, p. 1, 6, 39n. viewed April 6, 2016. ^ U.S. State Department, Dependencies and Areas of Special Sovereignty Chart, under "Sovereignty", lists nine places under U.S. sovereignty that are administered by the U.S. Department of the Interior: Baker Island, Howland Island, Jarvis Island, Johnston Atoll, Kingman Reef, the Midway Islands, Navassa Island, Palmyra Atoll, and Wake Island. ^ "Australia-Oceania: Midway Islands". CIA World Factbook. Archived from the original on January 21, 2019. Retrieved March 2, 2019. ^ "Australia-Oceania: United States Pacific Island Wildlife Refuges". CIA World Factbook. Archived from the original on February 16, 2019. Retrieved March 2, 2019. ^ "Australia-Oceania: Wake Island". CIA World Factbook. Archived from the original on January 31, 2019. Retrieved March 2, 2019. ^ a b International Court of Justice (2012). "Territorial and maritime dispute (Nicaragua vs Colombia)" (PDF). Retrieved 29 June 2013. ^ a b c d Moore, John Bassett (1906). "A Digest of International Law as Embodied in Diplomatic Discussions, Treaties and Other International Agreements, International Awards, the Decisions of Municipal Courts, and the Writings of Jurists and Especially in Documents, Published and Unpublished, Issued by Presidents and Secretaries of State of the United States, the Opinions of the Attorneys-General, and the Decisions of Courts, Federal and State". Washington, D. C.: U.S. Government Printing Office. pp. 566–580. ^ a b c d "Acquisition Process of Insular Areas". United States Department of the Interior Office of Insular Affairs. 2015-06-12. Retrieved July 15, 2016. ^ "Kingman Reef". Office of Insular Affairs. 2015-06-12. Retrieved July 15, 2016. ^ "AUSTRALIA-OCEANIA :: UNITED STATES PACIFIC ISLAND WILDLIFE REFUGES (TERRITORIES OF THE US)". The World Factbook. Central Intelligence Agency. ^ "DOI Office of Insular Affairs (OIA) - Palmyra Atoll". 31 October 2007. Archived from the original on 31 October 2007. ^ "Palmyra Atoll". U.S. Department of the Interior Office of Insular Affairs. Retrieved 23 June 2010. ^ "Definitions of insular area political organizations". Office of Insular Affairs, U.S. Department of the Interior. 2015-06-12. Retrieved September 30, 2017. ^ "Consejo de Salud Playa de Ponce v. Johnny Rullan, Secretary of Health of the Commonwealth of Puerto Rico, pages 6–7" (PDF). United States District Court for the District of Puerto Rico. Retrieved February 4, 2010. ^ "The Insular Cases: The Establishment of a Regime of Political Apartheid (2007) Juan R. Torruella" (PDF). Retrieved February 5, 2010. ^ a b "Balzac v. People of Porto Rico". U.S. Supreme Court. April 10, 1922. Retrieved October 4, 2017 – via FindLaw. ^ "Glidden Company v. Zdanok". U.S. Supreme Court. June 25, 1962. Retrieved October 4, 2017 – via FindLaw. ^ "CONSEJO DE SALUD PLAYA DE PONCE, et.al Plaintiffs v. JOHNNY RULLAN, SECRETARY OF HEALTH OF THE COMMONWEALTH OF PUERTO RICO, portion III.iii" (PDF). U.S. Supreme Court. December 2, 2008. Retrieved August 8, 2018. ^ a b c "Rassmussen v. U.S". U.S. Supreme Court. April 10, 1905. Retrieved October 4, 2017 – via FindLaw. ^ Juan R. Torruella (2007). "The Insular Cases: The Establishment of a Regime of Political Apartheid" (PDF). pp. 318–319. Retrieved February 7, 2010. ^ "Dorr v. U.S". U.S. Supreme Court. May 31, 1904. Retrieved October 4, 2017 – via FindLaw. ^ a b c "Downes v. Bidwell". U.S. Supreme Court. May 27, 1901. Retrieved October 4, 2017 – via FindLaw. ^ Zaide, Sonia M. (1994). The Philippines: A Unique Nation. All-Nations Publishing Co., Inc. p. 279. ISBN 978-9716420715. Retrieved October 20, 2011. ^ Okinawa Reversion Agreement – 1971, The Contemporary Okinawa Website. Accessed 5 June 2007. ^ a b Committee, America First (1 January 1990). In Danger Undaunted: The Anti-interventionist Movement of 1940-1941 as Revealed in the Papers of the America First Committee. Hoover Institution Press. p. 331. ISBN 9780817988418 – via Google Books.